The genetics industry is undergoing a fundamental shift from a clinical science focus to a bioinformatics focus. Genetic services require a greater level of data analytics sophistication than is required for other laboratory testing. Currently, data generated by new tests can overwhelm information technology systems and human interpretation capabilities. Our VarSeq® software can bring speed and efficiency to genetic testing labs by simplifying the process of analyzing and interpreting the data. With an intuitive design, VarSeq allows you to create a high throughput environment by creating repeatable workflows. VarSeq includes the necessary features needed for both commercially available and custom gene panels. Variants can be filtered using the BED files provided by manufacturers which define the panel's amplicons and "hotspots." 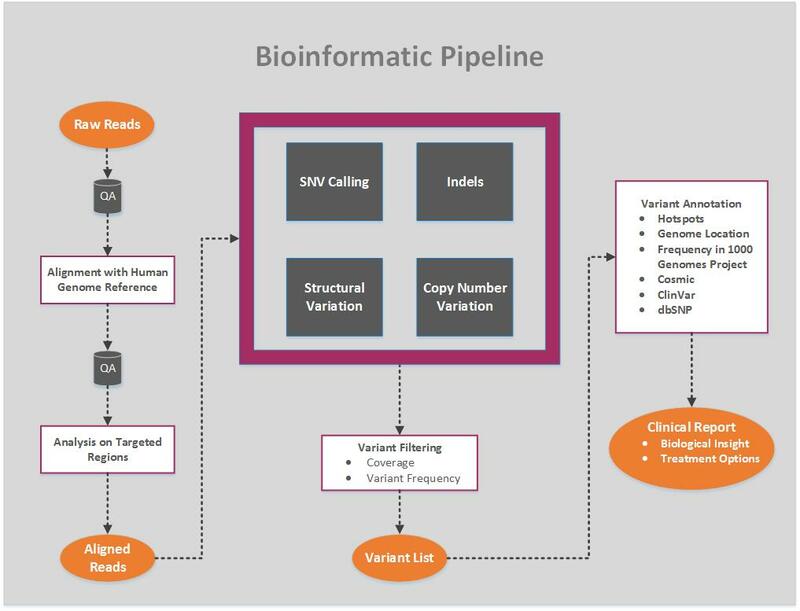 A wide array of annotation sources are available to provide additional information for both hereditary and somatic variants. Moreover, the VCF import process is optimized to produce variant representations which match those in annotation catalogs. Finally, variant blacklists can be created to filter variants that your lab has found to be inaccurate or not actionable. VarSeq enables cutting edge analysis by easily supporting whole exome and genome sized datasets. VarSeq enables breakthrough discoveries in cancer diagnostics by supporting gene panel testing and whole exome and genome analysis. Additionally, VarSeq supports tumor/normal workflows and includes the COSMIC catalog. Learn more about our cancer diagnostic capabilities here. Increase your lab's speed and efficiency by quickly and efficiently running batch samples. VarSeq allows you to create repeatable workflows. After you have set your desired filters and fine-tuned your analysis workflows for specific gene panels, you can save the workflow and apply it to future sequencing outputs without re-entering any parameters. Working in a high throughput environment requires increased power and flexibility and VSPipeline delivers. The command line runner provides you access to the full power of VarSeq's algorithms and flexible project template system from any command line context, including your existing bioinformatics pipeline. See more information on VSPipeline here. Convert the output of your tertiary analysis into a customized clinical report in one click. VS Reports provides the ability to generate clinical-grade reports. Reports are fully customizable, containing focused and actionable data. VarSeq ships with report templates that are modeled off of the ACMG guidelines. Templates for both hereditary and cancer analysis are included free of charge. VS Reports also comes with a commercial version of OMIN. For the full details of VS Reports, read more here. Baby Genes, a CLIA certified clinical laboratory formed in 2013 in Colorado is missioned to save lives by standardizing the approach to newborn screening (NBS) with a more comprehensive genetic sequencing-based test that screens for more conditions and provides more actionable information. Dr. Angie Purvis, Associate Laboratory Director and Clinical Research Lead at Baby Genes, has been a part of the test development which includes full exon sequencing of the genes associated with various conditions and diseases. However, for standardized NBS to be effective, it must be quick. Using VarSeq, the team at Baby Genes has shortened the turn-around time to only 48-96 hours from the time the sample arrives at the laboratory to the return of the genetic data back to physicians. VarSeq Software is intended for Investigational Use Only. The performance characteristics of this product have not been established.